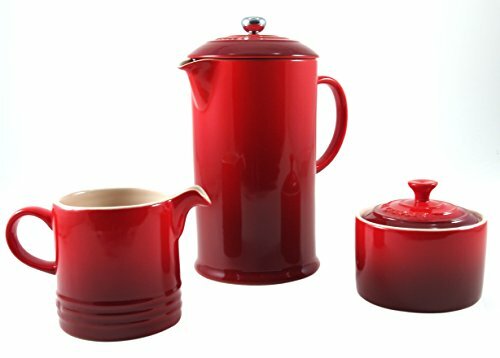 Enjoy a perfectly brewed, fresh cup of coffee with this Le Creuset French press coffee maker with matching cream and sugar set. Fabricated from cherry stoneware, it is long lasting and durable. With a high-quality exterior enamel coating to protect it against scratches, marks, and other damage, it is also odor and stain resistant. Featuring a stainless steel plunger and a mesh press, it also comes with a matching stoneware lid. The pour spout provides drip-free pouring, while the stoneware construction has less than 1% porosity, blocking moisture absorption, which prevents cracking and rippling along the interior. This French press also comes with a cream and sugar set made of matching stoneware perfect for the tabletop year round. Both the French press and cream and sugar set are backed by a manufacturer's five year warranty, and dishwasher safe for easy cleanup.